Using a content locker plugin on your WordPress blog can drastically improve traffic generation or monetization. It works by blocking users from accessing some select content on your website and unlocks them instead of some specific action. These actions can be as simple as sharing the content, or you might even compel users to subscribe to a paid membership. WordPress doesn’t offer any content locking features by default. But this isn’t stopping us. We can use dedicated content locker plugins to integrate the functionality to our website/blog. There are hundreds of great content locker plugins for WordPress which might even leave you confused as to which one to pick for your website. To successfully utilize these plugins to their full potential, make sure to only apply it to your most valuable content – ones the readers will be urged to read. Also, it helps if you allow readers to access a part of the article, and locking the remaining portion. This way, the engaged readers will willingly share or pay to unlock the content to get to the end. In this article, we have put together a shortlist of some of the best content locker plugins for WordPress. You are bound to find something that fits your requirements. The list is also kept diverse regarding budget, with a decent collection of both paid and free plugins. 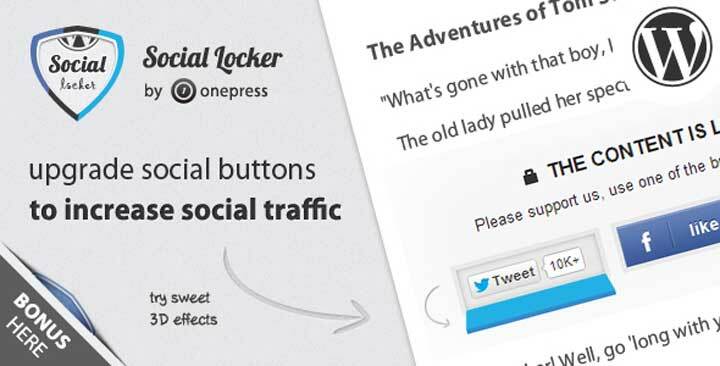 As you might have guessed from the name, Social Locker for WordPress is a content locker plugin which will unlock the content upon a social share made by the reader. It is super easy to use. Just install the plugin, select the content which you wish to lock, and you’re done. The reader will get a prompt to “pay a ‘like’ to unlock/access the locked content”. This content locker WordPress plugin is compatible with all the popular social media handles, including Facebook, Google, Twitter, and LinkedIn. You can prompt users to share the content through these social media networks, or even sign-in using one of these social media handles. The latter option will automatically register the user on your website, and you will collect their email address and names. Other features include the option to stylize the content locker box so that it doesn’t appear off-putting. You can add effects and customise the box to make it as attractive and appealing as possible. Another useful feature is to blur out the locked portion of your article. Other than this, the plugin can also give you an advanced analytical look at user behavior around your content. Ultimate Membership Pro isn’t strictly a content locker plugin. 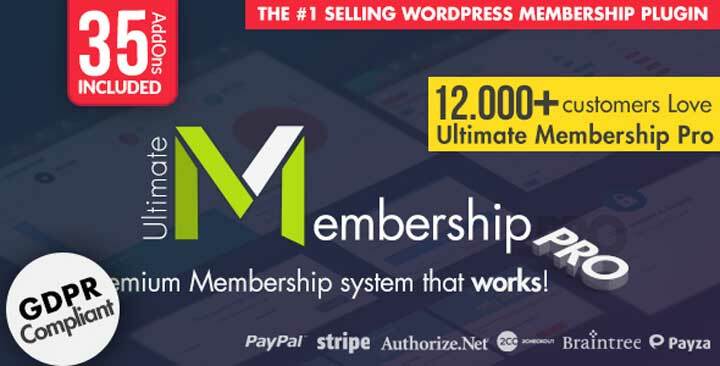 It is used to create an advanced membership system on your WordPress website. However, it does come with a dedicated content locker functionality which you will like. With this content locker WordPress plugin, you can lock any portion of any content on your blog or website. After that, you can either ask your readers to be unlocked the content by signing in using their social networking handles. This will make them a free member on your website. You can also include a payment option and generate more paid members for your website. The plugin support for all the major payment gateways, including PayPal, Stripe, Authorize.net, and much more. And this is just the content locker side of the plugin. You will get plenty of other features related to member management. WP Private Content Plus is a freemium content locker WordPress plugin. If you want a decent content locking functionality for your website, then its free version will more than suffice, but access to more premium features will require to you to grab its pro version. For free, this WordPress content locket plugin allows you to restrict guest from access not only your posts but also your web pages and custom post types. On top of that, you can also limit some of your site members or users to access certain parts of your website. You will be allowed to protect your posts based on user groups, user roles, members, user role levels, and much more. And if you choose to get the paid version, then you will gain access to a laundry list of advanced features. Some of the notable features include the option to accept payment for paid membership, option to create premium membership plans, group management options, and much more. Social Share & Locker Pro is a content locker plugin for your WordPress blog with a focus on social sharing functionalities. It packs in a boatload of features to help you maximise your social shares and get more social traffic. For starters, it is compatible with over 44 social networks which include all the popular social networking sites. You will also get a great deal of customisation control. For example, you can choose how you wish to display a particular sharing button, use specific templates, choose between a vertical or horizontal position, show social counts and much more. Other features include the option to use animations, eight different custom themes for the social locker, opportunity to show the social lock over a particular content while blurring out the back content, delay effect, smart targeting, and much more. 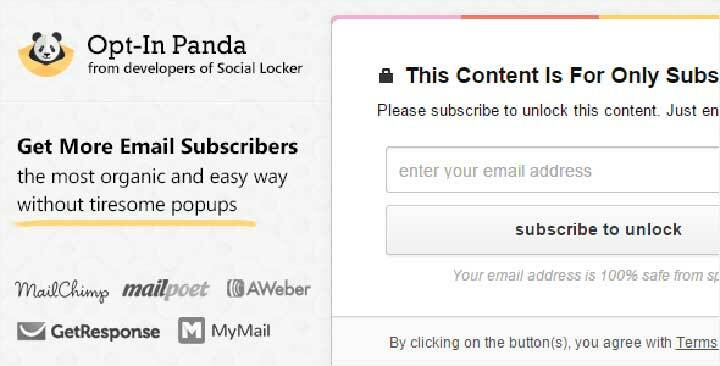 Opt-In Panda WordPress plugin will help you to lock a portion of your website content by completely hiding it or blurring it, and then ask users to subscribe to gain access. The plugin is handy if you wish to build your email list and want to increase the number of members on your website. However, it will not be an excellent means for generating more social traffic or for monetising your content. You can include single opt-in as well as double opt-in to gather a user’s email address. It also integrates with all the primary mailing services like MailChimp, AWeber, and ten others. Alternatively, you can also display social login options. The plugin supports mostly all the popular social networks including Google, Facebook, and Twitter. There is also the option to add Overlay effects to make the content locker display more attractive. Customization options are also plentiful. You can also create custom fields relevant to your business which the readers must fill out. And best of all, the plugin gives you detailed analytics on how the lockers are performing and affecting your conversion rates. You can use the insights to optimize your strategy better. 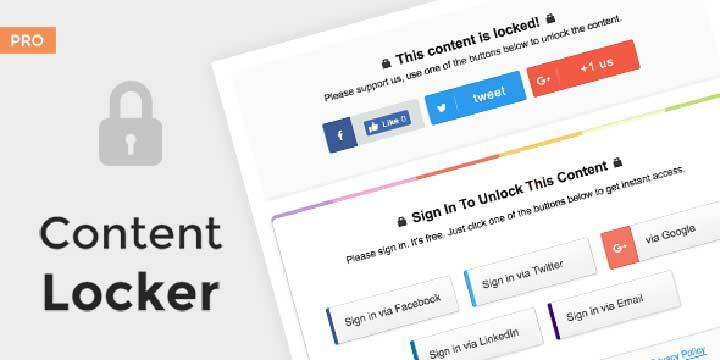 Opt-In Content Locker WordPress plugin will lock help you to secure your valuable content and ask readers to subscribe to gain unlock it. Functionality wise, it does pretty much the same things as all the other plugins on the list. However, its key selling point lies in all the customisation options. This WordPress content locker plugin features over 60 setting options which you can use to customize the look and feel of the content locker. Sometimes, the content locker box might feel unprofessional or ugly which might reduce your conversion rate. However, with this plugin, you get a host of different customisation options as well as WYSIWYG editor so you can create a beautiful subscribe box. Besides this, the plugin includes support for 9 of the most popular email marketing services. You also get a regular and a soft locker mode. It is also caching friendly and works seamlessly in desktop as well as mobiles. Google/universal Analytics event tracker is also provided. 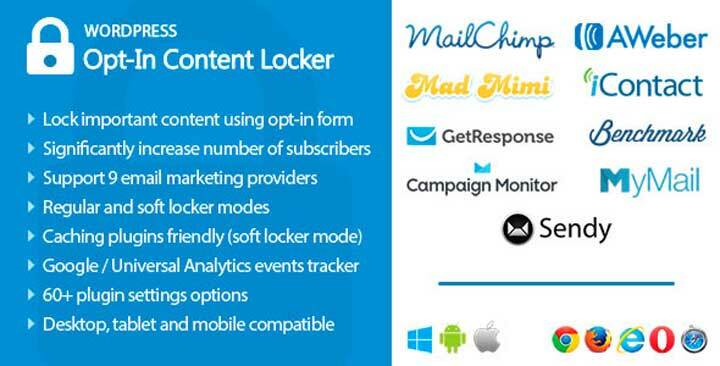 A simply named content locking plugin for WordPress, Content Locker Pro features a lot of useful options and functionalities to help improve your site’s share counts and likes or to expand your mailing list. You will get access to a lot of designing and customization options, packed with advanced lock options. For starters, you will get 16 awesome locker designs. Eight designs for the social locker and 8 for the Sign-in locker. For the social locker, you have support for all the popular social networking platforms like Facebook, Google, Twitter, LinkedIn, and YouTube. And if you wish to use the sign-in locker, then you have access to 16 leading email marketing services including MailChimp, MailerLite, and AWeber. Other features include stuff like advanced analytics, performance tracker, Ajax loading, lazy loading, option to show terms and policies, delayed content locking, and much more. Locker Cat is a Social Locker WordPress plugin which is extremely user-friendly. You can use it to hide different content on your website including videos, images, and download links, apart from simple text-based posts. The plugin works by using shortcodes to wrap your content which makes it super easy to implement. Now it is worth noting that this is a free plugin. Therefore, it lacks many advanced features present in all the premium alternatives. For example, it only supports two social networks – Facebook and Twitter. However, the lack of features does it make it super lightweight, and thus it doesn’t affect the loading time of your website. It is also SEO friendly and keeps all the content visible to the search engines so that your SEO score is not compromised. Donation Content Locker is a premium content locker plugin which will keep precious and valuable content on your website hidden or locked, unless and until a user donates. This plugin works by using shortcodes. All you need to do is wrap the desired content with the shortcode, and the content locker will hide it. Now, for people who wish to donate to view the content, you will have five payment gateways options to provide them. This includes PayPal, Authorize.net and some more. The reader will be allowed to donate any amount they want, but the admin can set a minimum amount. Other than this, the plugin features a WYSIWYG editor to creating the donation box, a lot of customization options, support for a dedicated terms and conditions section, Single donation option, option to remember donors using cookies, and much more. Any Other WordPress Content Locker Plugin? So these were our picks for the top 9 content locker plugins for WordPress. We hope you found this read to be helpful. Do share this along with your blogger friends to help them attract more traffic, or monetize their valuable content. Also, if you are already using one of the content locker WordPress plugins we have mentioned here on the list, then please share your experience using them. Your fellow readers will love to hear about your personal experience, which might also help them make their own decisions.